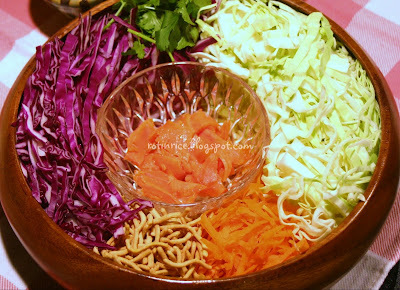 Yee Sang, the raw fish salad from yesterday’s post was the highlight of our Chinese New Year Eve’s feast. Our guests really enjoyed the light, tangy taste of the salad and the experience of doing the tossing. It was a lot of work to prepare the dish, but it was well worth the effort. Later that evening, after making the post on my blog, I chatted over the internet with a dear school friend about the “dish”. While chatting with her, I had a sudden inspiration to create a fast and easy American version. 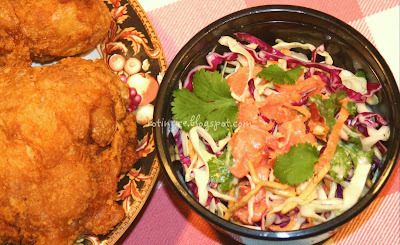 It is a twist on the all-American favorite coleslaw. All ingredients can be found in the regular grocery store. I used smoked salmon for the fish and packaged chow mein and fully cooked bacon for the crisps. Red and green cabbage, carrots, and cilantro gave the coleslaw those vibrant colors. It only took 30 minutes in all for me to slice the vegetables, make the dressing, and cook the bacon. I bought the 8 piece fried chicken deal to go with the coleslaw. It was great! Minimum preparation for a meal after a day out, and especially after so much cooking the day before. 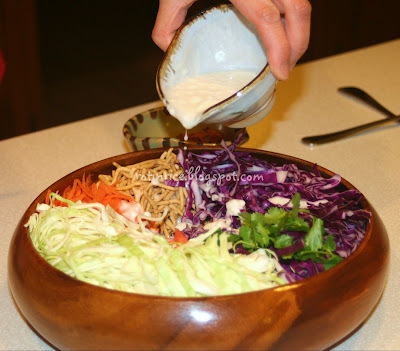 In a bowl stir together vegenaise or mayonnaise, rice vinegar, sugar and salt. Pan fry fully cooked bacon to desired crispness. Cut into bits with kitchen scissors. Slice smoked salmon into strips and place into a small bowl. Pour 1 tbsp lemon juice over salmon. 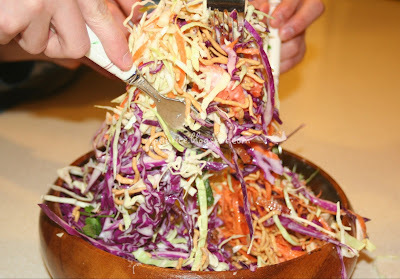 Combine vegetables, noodles, salmon, and bacon in a large salad bowl. Pour dressing over vegetables and toss to coat. 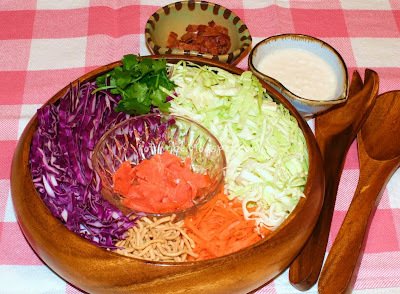 Note: For a team event, arrange vegetables, noodles, salmon, and bacon in a large salad bowl or platter in sections. Pour salmon, bacon, and dressing over vegetables. Get everyone to toss with forks. …..serve with crispy fried chicken. Yum! The combination of smoked salmon and bacon sounds terrific – this is a must try dish! 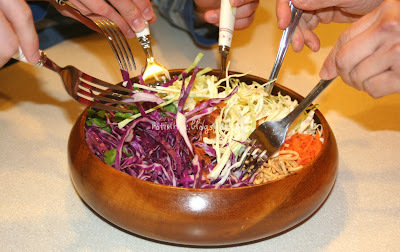 Yee Sang and the wood dish look so wonderful together! You have some really cool kitchen tools at home. Very creative~ I do add smoked salmon sometime and adding bacon would be better! What a brilliant idea to use raw vegetables – it will be crunchy and refreshing! Although, I do know what my youngest child will say about that. Excellent tip! 5 Star Foodie – Yes, it turned out really well. My boys liked the bacon bits and crunchy noodles in there! Angie's Recipe – Thank you! I have had that salad bowl for years and it is pretty well seasoned by now. Anncoo – Thank you! The bacon made it very tasty. DongXing – Thanks! Do try it as it is simple and easy to make. The noodles gave it that extra crunch. 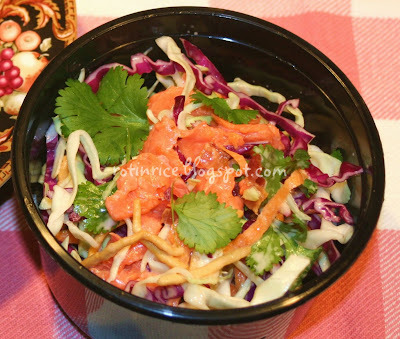 Bacon in Yee Sang – very novel and imaginative. I have to try this!